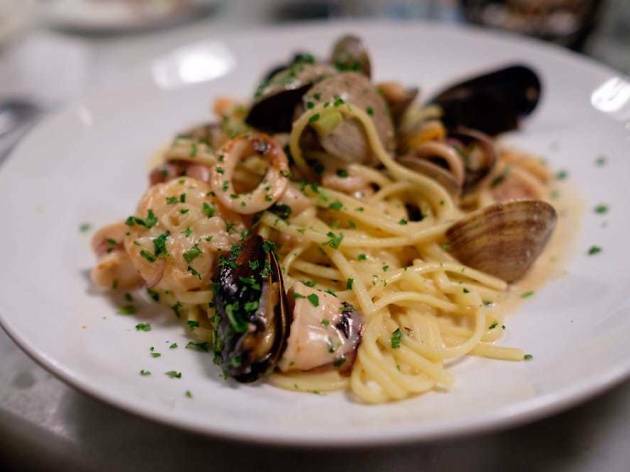 Sotto Mare is a family-run seafood joint in the heart of North Beach. It’s owned by husband-wife team Laura and Rich Azzolino, both North Beach natives, and has earned a following among locals and tourists alike. 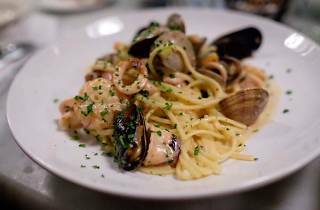 The menu is Italian focused—thus, the North Beach influence—including an array of seafood pastas and mains. The raw bar offers fresh oysters, clams, and cracked crab, while salads are heaped with crab, prawn, Bay shrimp, and octopus. The creamy clam chowder, sprinkled with bacon, could be a meal in itself. But the spot’s most famous dish is the crab cioppino, a spicy, warming seafood stew that’s large enough to serve two. Grab a pint of clam chowder to go at the case up front.